Easy way to turn a boring chicken thigh into the star of the meal. My family thinks I slaved over these this weekend. In a Cast Iron Pot heat garlic and 1 tablespoon of butter over medium heat until garlic begins to soften. Place chicken thighs in pot, skin down, for 2-3 minutes and then flip to other side for additional 2-3 minutes. Remove chicken thighs from pot, add remaining ingredients (except parsley) to pot and stir slowly until all maple sugar is mixed in. 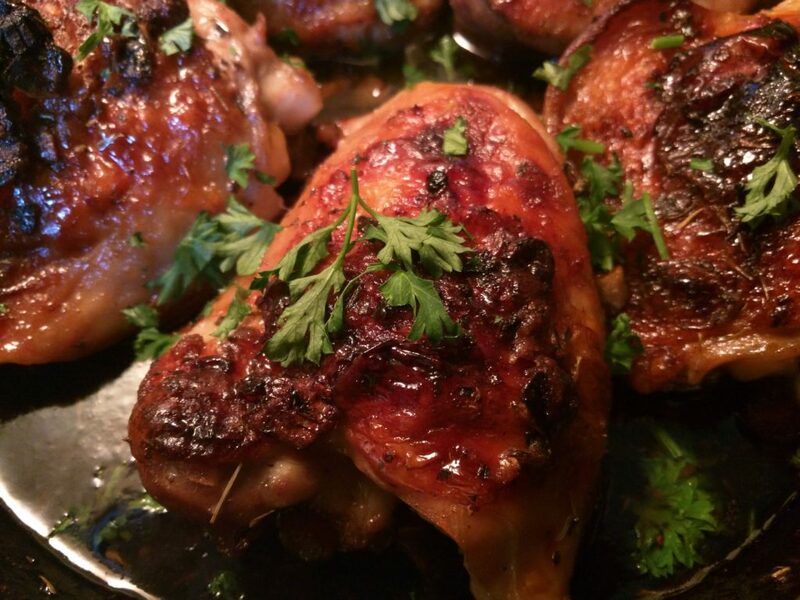 Place chicken thighs back in pot, skin up, and place Cast Iron Pot into preheated oven. Cook for 30-45 minutes (oven times vary) or until the chicken has an internal temperature of 165 degrees Fahrenheit.